We were off at the crack of 10:00AM. All secondary roads until we hit a short section of I 90 going into Niagara Falls, then all interstate (well, inter province) roads to the Golden Pond RV Resort. The truck towed the 21 with no problems. I started towing in the Tow/Haul mode, but discovered that I did better going back to the standard mode. While it isn't a long test, it did 12.1MPG, mostly in 7th gear at 60MPG in Tow/Haul, and 12.8 MPG in the standard mode, mostly in 8th & 9th gear towing closer to 63 MPH. All on fairly flat roads. I expect the Tow/Haul will be more useful once we hit some hills. The campground is interesting. Seems we hit a holiday weekend here in Canada, and everything is full. After no luck at the first couple of places, the Golden Pond RV Resort in Mossely, ON said they could find a place for us. The first attempt didn't work. It wasn't an actual campsite, but on grass next to the movie screen. The problem was no electricity. With it being 92°F, we wanted to be able to run the ACs. They found a space near the end of the campground that had one 50 amp receptacle & one water faucet. Now, we are paying $68.93 Canadian for each site, so we really wanted electricity for both of us. 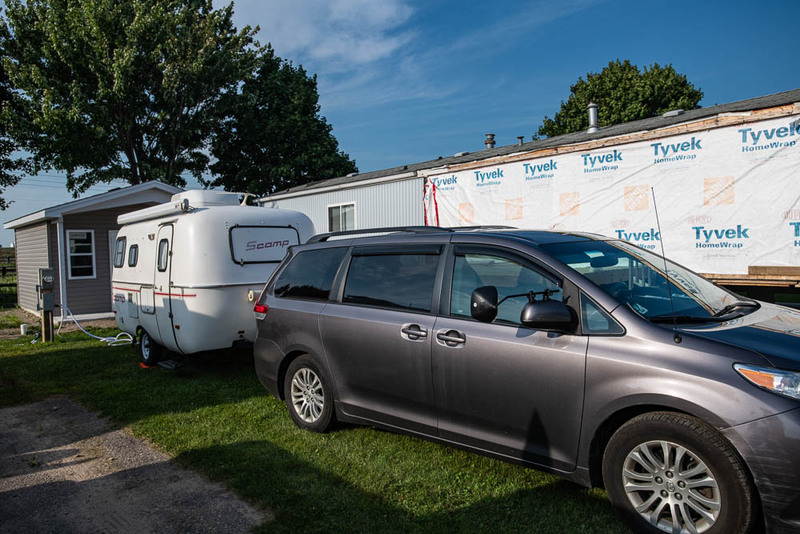 First attempt was to plug Don & Anne's Scamp into my outside receptacle, and connect my trailer to the 50 amp receptacle with a 50 to 30 amp adapter. While it worked, I was drawing 24 amps on my 30 amp main breaker, and was concerned that if the compressor on both trailers started at the same time, it wouldn't be good. The guy who guided us to our sites found a 20 amp receptacle on the permanent trailer next to my trailer, so we ran 60' of #10 trailer cord & Don's 25' #10 extension cord to reach his trailer. He is getting 112 volts at the trailer with the AC running, so it looks like it will work. Evidently, resorts in Canada are no better than resorts in the US. Still, it is better than spending the night at Walmart (although a lot more expensive!) By the way, the showers are a long way away, and require a Loonie (old style, not new style) for 7 minutes. Probably not high on my list of favorite campgrounds. Dinner was at the campground restaurant. A very limited menu, but OK food, and inexpensive. I had a Western sandwich, which is a western omelet on toast. You won't be seeing this post until at least tomorrow. The campground WiFi doesn't seem to want to connect to the internet, even at the office, and both AT&T & Verizon show no service. 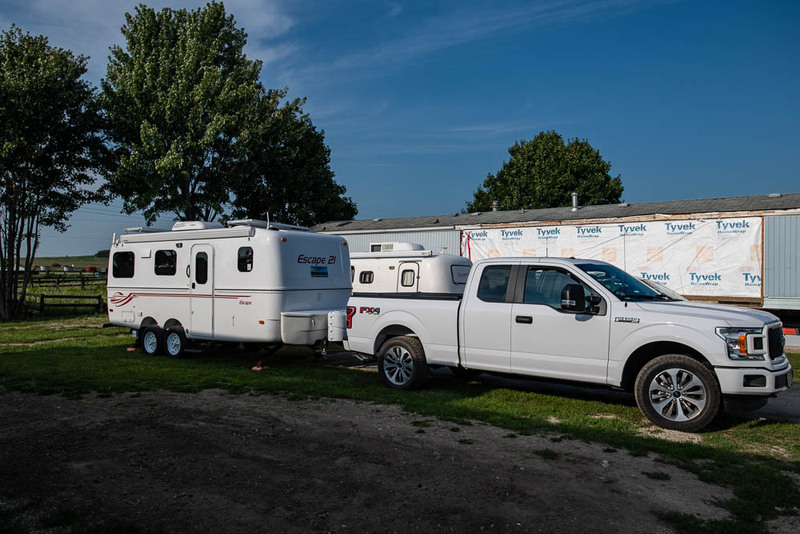 Anne was able to set up roaming on the Rogers network (at $.35 per minute after paying for a month of "AT&T supplied Canadian service) on her phone as they crossed the border, but I was busy driving & didn't try until I got to the campground. Again, no service at either, and no roaming offer. The interesting part of all this is my AT&T plan includes Canadian coverage the same as the US coverage, and Verizon stated they would give me the same coverage in Canada as I have in the US for $5.00 per device, per day. Neither does much good if they can't connect!